Saturday night I multi-tasked. This is to say I watched a movie and explored Technorati on my laptop at the same time. The movie? you ask. 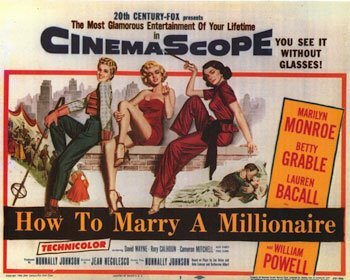 It was How To Marry A Millionaire starring Marilyn Monroe, Betty Grable, and tough-as-nails Lauren Bacall. The premise: three women decide they can put their scheming minds and limited resources (or is that limited minds and scheming resources?) together to snag millionaire husbands. It’s a comedy in that zany way movies from the 50’s are “comedic.” All the while I am watching such movies and laughing, I am wondering: am I laughing at this because it is funny-funny or because it is fifties-funny (you know, dated and that sweet kind of naive humor that makes you want to say “ahhh, people used to think that was funny, or zany, or out-of-the-ordinary at least). The costumes, err, dresses, alone are worth the 93 minutes it takes to watch this movie. There are moments of when you’ll laugh for whatever reason…watching Marilyn Monroe, whose character Pola can’t see a lick without her glasses but refuses to wear them (because you know what they say about girls who wear glasses) or the way that anything really great is referred to as just “creamy” (this makes me wonder if someday we’re going to look back and feel the same way about the word “amazing” used as a constant adjective….yes, I sometimes falter and use it myself though I am thoroughly over its use in daily vernacular–constantly! “Her work is just amazing!” “That show was totally amazing, you know? !” Maybe this deserves its own post someday? That would be, well, amazing, right?). OK, so about Technorati. It was right on. Got it right away. Did the searches. Thought that it was great to find PLCMC bloggers’ posting appearing when I did the tag searches. I think this could be a terrific resource for serious bloggers (and there are so many of them)! Oh, and the movie was in Technicolor! Tech….how the prefix has changed since 1953, huh? It’s totally creamy and amazing!